Touch Screens: Love ’em, hate ’em, would you want to date ’em? I think we can all agree that touch-screen tablets are awesome. We can swipe to turn a page, fire a bird, or zoom in on a pretty picture. But one place where touch-screens are a bug and not a feature is laptops. My ASUS netbook runs Windows 8.1 and has a touch-screen. Since Windows 8.1 is an operating system designed for both laptops and tablets, you’d think having a touch-screen would give me access to a new array of features. But truthfully I, and I suspect many other, Windows 8.1 laptop users never use apps, and are typically just trying to do the same computing or gaming tasks I always have. Windows executables aren’t designed with touch-screens in mind like apps are, and are typically keyboard and mouse driven. The mouse is an incredibly precise instrument with sensitivity I can tune and a comfortable feeling in my hand. A keyboard allows me to type faster than I can talk and almost faster than I can think. My fingers on the other hand, are incredibly imprecise. Even on a tablet when I’m trying to type a letter, I always end up hitting the one (or three) keys next to it. The cursor is never where I think it is supposed to be and unless an app has big friendly buttons, I am landing somewhere I don’t want to be. Some might say, well use a stylus, and again on a tablet that seems to make more sense, the technological equivalent of a notepad and paper. But on a laptop I’m reaching across my keyboard to poke my screen. And let’s not forget the cleanliness issue. On a tablet I can hold it in my palm and run a cloth over it. On a laptop I have to tilt it on its back and rub it in concentric circles (usually while powered off so as not to mess up the spinning hard drive). If I want to remove a visible speck from my line of sight, I find that I’ve accidentally scrolled or clicked on something and I have to use the mouse to get back to where I was going. One time I apparently applied too much pressure and I had an LCD pulsing circle on my screen where my finger used to be that wouldn’t go away until I rebooted the machine. For those of you with pets you may have experienced a cat that likes to rub itself against the corner of your laptop. If it wraps a paw or even a whisker around the corner, they are scrolling your screen for you, which while funny is also kind of annoying. There should be a button or an easy to access setting that turns the touch-screen off but as of yet I haven’t found it, and the procedures that have been suggested mess around with corners of the machine I prefer not to touch unless absolutely necessary. So I live with it. Even devices like the Surface Pro 3 don’t make sense to me when in laptop mode. If I were the engineer who designed this, I’d have the touch-screen disabled when the keyboard is attached (or at least make that an option). My ire for this device may be due to a really aggravating and kind of silly ad against a Mac Book this Christmas (‘It’s got a USB’. Well yippee). In short, touch-screens on something I can hold in my hand, great. Otherwise, keep it simple. Any technological ‘features’ that are really ‘bugs’ in your life? We don’t notice how dependent we are on technology until it fails us. Now I’m pretty flexible when it comes to tech. I can get productive work done on just about any device, no matter the operating system, software or hardware involved. But the one thing I really can’t compromise on is a good keyboard. Often when I’m out writing in a coffee shop I play a little game with myself where I try to bring the least amount of tech possible to get the night’s work done. I’ve recently adopted a “one bag” (I used to carry three) policy with my work tech, and that’s been going great. I used to (and frankly still do) lug around a lot of things I don’t really need, because I wasn’t making decisions about what I was actually going to do. So for a writing night “one-bag” becomes “tablet bag”. Now I’m still traveling with two tablets, a notebook, chargers and a crap ton of pens, but at least it doesn’t weigh very much. I even have a plug-in keyboard for one of the tablets, so I can turn one of them into a micro-computer even smaller than my old netbook. At first I tried to convince myself that writing slower is good for me. Having to type and retype each word was good for organizing my thoughts, much in the same way people use writing by hand. Punching the keys as hard as I can is just a way of more physically engaging with the piece beyond just the simple mental exercise. Or maybe the keyboard, particularly the space bar, was unresponsive, designed for short e-mail compositions of maybe 50 words, not 500 words synopsis. The evening was saved by having the notebook, so I could at least take some good research notes for fleshing out when I get back to a proper computer. But I doubt I’ll be taking out that portable keyboard any time soon. I’m not used to attacking my keys. Most keyboards I’ve worked with allow me to apply light pressure to accurately type each word. And I’m not even particular about “correct typing”. Like a lot of people of my generation I tried to “learn to type” long after I’d already developed bad habits of using computers, and I still type in a way that never uses my pinky finger, often having it just pointing up in the air. Probably this will be responsible for hand cramps later in life, especially considering the volume of typing I do, but maybe at that point text to speech will be to a point where keyboards will no longer be necessary. Writing by hand isn’t frustrating because at least my fingers do not rebel and write the wrong letters (though from my handwriting it might be hard to tell). I don’t miss spaces, and I can write at a speed a lot closer to the one my brain moves at. There’s definitely an optimal speed to writing, fast enough to keep up with your brain, but slow enough not to skip words or whole thoughts which you’ll just have to come back to later. How do you do most of your writing? Are you as particular about writing implements as I am? This is the first eReader Amazon’s put out in a while that I actually think is as good of a device as my current Kindle. My 4th Generation Touch has a 4GB capacity, has a speaker out for MP3 playback, can support text-to-speech as well as simple games and a web-browser, and cost me about $100 at the time I bought it. 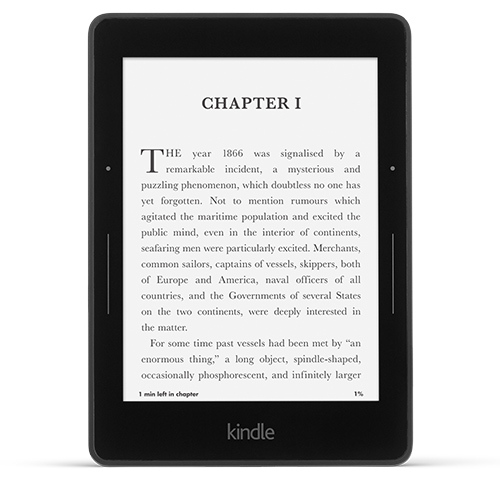 As with all eReader’s these days, the new Kindle has none of the extras the old Touch did (except maybe the browser and active content), but at least it finally has a 4GB capacity again (I was getting kind of annoyed at looking at $119 devices with only 2GB capacity). The product specs say its a little faster and a little lighter, but basically this is the same dependable Kindle device you’ve come to know and love. It’s nice that the low-end Kindle now has touch as this is an essential eReader capability. 167 ppi might sound low when compared to the 212 and 300 of their other reader devices, but trust me, its fine. My old Nook Simple Touch was a better device with an expansion slot for more books (up to 8 times the capacity) and side buttons as well as touch, but unfortunately nobody bought them and now Nook only sells the GlowLight and the Samsung Tablet *sigh*. This doesn’t have the back-lighting of the Paperwhite, but personally I’ve never understood that feature. Why build a night-light into the device for which you’re paying at least $20-40 extra, when a stand-alone clip on night-light or heaven forbid, lamps, are so much cheaper? I’ll probably end up replacing my old Touch with this device eventually, though I will miss the extras. But only when my old device dies. I’ll admit, this one is tempting. I’m a little bummed about the 8GB capacity, but for an extra $20 you can double that. And it comes in colors, though admittedly the only other one I’d consider is blue. I actually am fine with the old T-Model Ford colors (you get your choice of color, black). I use my current 7″ (also 8GB) Fire tablet mostly to read comic books. And here’s where we hit a snag. Comic books are already a bit of a stretch a 7″, but are mostly readable with a little optimizing. But I have a feeling 6″ will feel too cramped. Now there are things like guided view (where you see each comic panel one at a time), but I’ve always felt this took away from the experience, and a lot of the comics I own are in PDF format from things like Humble Bundle (so no guided view). For gaming on the other hand this should be a great device, with a quad core processor this can handle the heavy lifting on graphics intensive 6″ (mobile oriented) games. And that’ll make steaming to the device more pleasurable. However, I suspect this tablet will also run into stiff competition against phablets (phone tablets) and larger smart phones. 6″ doesn’t feel big enough to justify the separate device (even though it’s fine for the eReader, but that’s only text). It has front and rear cameras like most phones, but again people will probably be wondering why it can’t make calls. 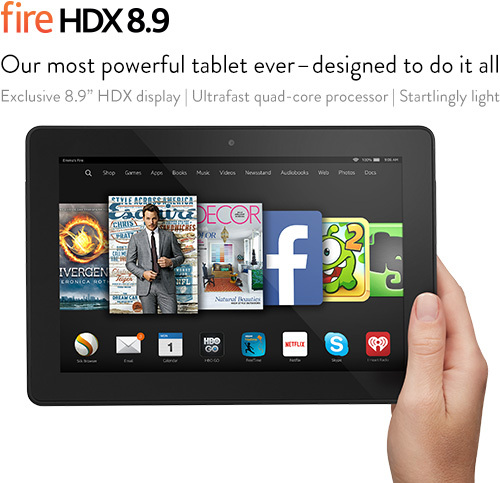 This is Amazon’s foray into being more like Apple (i.e. producing a device for book snobs). 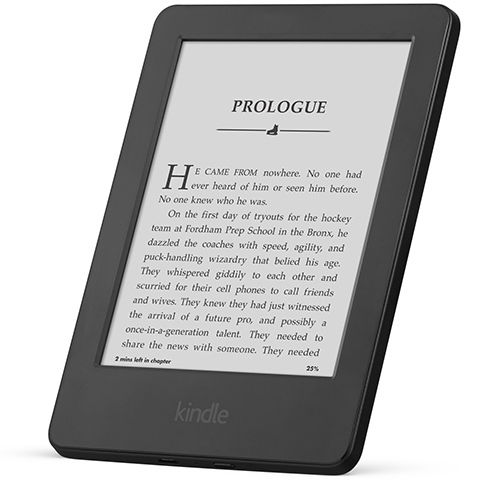 It’s the same size as the regular Kindle (actually a tidge smaller) with more pixels (300 ppi vs 167 ppi), has a built in light with an adaptive light sensor, touch screen and “page press” a new technology that lets you turn pages without lifting a finger. The Voyage by its own admission is trying its best to be an actual physical book book, and not an eReader. Pushing buttons and swiping fingers are considered unnatural reading experiences. I’m not exactly sure how page press works (would need an actual device to play with as their video doesn’t show much), but it basically seems like a combination of slightly moving your thumb and applying light pressure to turn pages. As an engineer I doubt this was implemented perfectly the first time for all users. This feature will probably result in more accidental page turns than touch ever did. You know the best device that eliminated swipes? The Nook simple Touch with buttons on each side and a contoured back that fit naturally in your hand so you could just lightly press up and down to turn the page. *sigh* Last rant I promise. You can get 3G with this device as well, but that’s really only necessary if you must be able to buy a book literally anywhere. Most of us avid readers are fine with loading the device on our free home WiFi and taking it out into the world. This device seems expensive and tries to solve problems it will never be able to solve. If you’re really that much of a bibliophile, spend that $199 on real books. (Also it’s kind of a silly name). 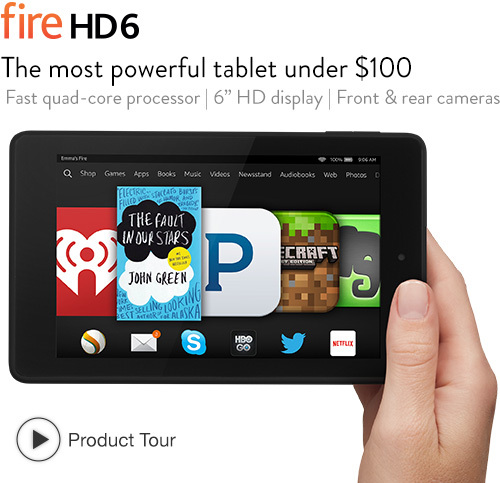 Basically this is a re-packaging of their new Fire HD6 and the HD7 with a hard shell case. 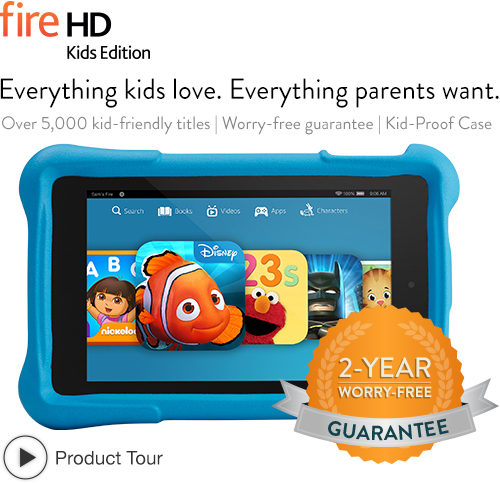 It comes with a year free of Amazon FreeTime, which allows kids to play all sorts of apps and things, and Amazon will replace it no questions asked in the first 2 years if the kid drops it and breaks it. $50 for a hardshell case and some apps feels expensive, considering that replacing the device outright would cost $99. But my basic feeling is this: you shouldn’t be buying an expensive tablet for your kid if they can’t be responsible enough to take care of it. Tablets and other devices of its ilk are being introduced to children too early. I know that there’s a lot of neat ways to entertain and maybe even learn on these devices, but I’d resist buying one until they were at least in 5th – 6th grade. That commercial that Amazon is airing for the Amazon Phone is disturbing (if you haven’t seen it it features 9-ish year old kids talking about watching Skyfall and The Hunger Games and also spending all day on their phones). If you want to use a tablet with younger kids, buy it for yourself, and supervise its usage. (Okay I guess that technically was a rant too). I can’t believe I’m paying nearly $400 for a device and I’m still getting ads. Look, honestly at this point buy an iPad. Or even better, any one of a dozen android tablets (ASUS brand especially) with the same capacity, size and hardware (and probably a lot cheaper). ‘Nuff said. One other thing: Amazon introduced a payment plan for these devices (sounds like just one eReader and one tablet for each user). You pay 20% up front, and then the rest in installments for 4 months. Sneaky way to get people to buy technology they don’t really need, or considerate offering that lets you spread the pain? You decide.